A man yelling “all these Jews must die” burst into a Pittsburgh synagogue during Sabbath services Saturday, shooting indiscriminately and killing 11 congregants in the latest mass shooting in the United States. Six people, including a police officer who confronted the attacker, were wounded, according to officials, who say two of the civilian victims are in critical condition. This is “likely the deadliest attack on the Jewish community in the history of the United States,” according to the Anti-Defamation League. 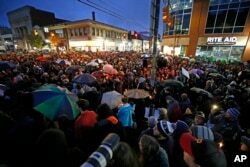 A crowd gathers at the intersection of Murray and Forbes Avenues in the Squirrel Hill section of Pittsburgh during a memorial vigil for the victims of the shooting at the Tree of Life Synagogue, Oct. 27, 2018. The Federal Bureau of Investigation is taking the lead, investigating the shooting as a hate crime. Wendell Hissrich, Pittsburgh public safety director, speaks to media as Pennsylvania Governor Tom Wolf, right, looks on after a gunman opened fire at the Tree of Life synagogue in Pittsburgh, Pa., Oct. 27, 2018. The suspect in custody, 46-year-old Robert Bowers, from just south of the city of Pittsburgh, is in fair condition with multiple gunshot wounds, according to Pittsburgh Public Safety Director Wendell Hissrich. ​Federal prosecutors have charged Bowers with 29 criminal counts, including violence and firearms offenses, and violating U.S. civil rights laws. “We are dedicating the entire resources of my office to this federal hate crime investigation and prosecution” said Scott Brady, the U.S. attorney for western Pennsylvania. Authorities say the suspect was armed with an assault rifle and three handguns when he entered the synagogue where about 80 people had gathered for weekly worship, as well as a circumcision ceremony. Social media posts attributed to Bowers indicated his hatred of Jews. Jones added that the synagogue mass shooting is the “most horrific crime scene” he has seen in his 22 years with the FBI. “The vile, hate-filled poison of anti-Semitism must be condemned,” U.S. President Donald Trump declared. “Our minds cannot comprehend the cruel hate and the twisted malice that could cause a person to unleash such terrible violence during a baby-naming ceremony — this was a baby-naming ceremony — at a sacred house of worship on the holy day of Sabbath,” Trump told the FFA, formerly known as the Future Farmers of America, at their national convention in Indiana. 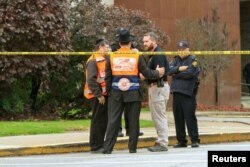 Police officers guarding the Tree of Life Synagogue following a shooting there speak with men in orange vests from a Jewish burial society in Pittsburgh, Pa., Oct. 27, 2018. At a political rally in Murphysboro, Illinois, the president told the partisan crowd he would be toning down, for the evening, his trademark criticism of political opponents amid the somber national mood. Pennsylvania Gov. Tom Wolf and Wendell Hissrich, right, Pittsburgh public safety director, speak to media, after a gunman opened fire at the Tree of Life synagogue in Pittsburgh, Pa., Oct. 27, 2018. People walk by as the municipality building in Tel Aviv is lighted in the colors of the American flag in solidarity with the victims of the Pittsburgh, Pa., synagogue attack, Oct. 27, 2018. ​Several Sabbath services and the circumcision ceremony for an infant, on three levels of the building, were underway in the predominately Jewish neighborhood of Squirrel Hill at 9:30 a.m. local time when the first shots were fired, according to congregants. Tree of Life traces its roots back to the beginning of organized Judaism in Pittsburgh in the mid-1860s and has occupied its current building since 1946.